Shao Yun’s Recollection of Master Xu Yun. The old monk was 117 years old, and stood at over two meters tall. His arms were long and his hands reached down toward his knees. His eyes bright and piercing and he could read the newspaper in small print from the light of a lamp at night, and never needed to wear glasses. His teeth were neat and tidy – Xu Yun said that after 90 years old the teeth regenerated. His voice was very loud and powerful. When speaking in a loud and clear voice in the meditation hall, his voice would sometimes make the monastery bell vibrate. The master had arrived at Zhen Ru in 1953/54, finding only rubble and weeds. During the Japanese occupation, much of the monastery had been destroyed by a deliberate fire. There were a few monks on the mountain at that time, but soon the population grew as people learnt of Xu Yun’s presence. Xu Yun petitioned and received permission to re-build the area and open-up waste land for the growing of sweet potatoes and rice – so that the monastery could be self-sufficient. When I arrived in the area in 1956, much of the land had been re-claimed for crops. Master Xu Yun was already 117 years old at this time, but insisted that he over-saw all the re-building and farming projects going on, on the mountain. Often, he would instruct personally on how to proceed, or on how to do some thing in a more efficient manner. He also had to receive visitors throughout day, many of whom were public figures. At 6pm he would teach for two hours in the meditation hall. At 8pm he would begin to look through the letters the monastery had received that day – some times as many as a hundred. He would personally hand-write replies to important letters, and dictate responses to others. At midnight master Xu Yun would go to bed. He would rise at 2am and meditate until 330am – and then get-up and wash.
Master Xu Yun did not use toothbrushes, but would rinse his mouth with warm water, he would then spit the mixture of saliva and water onto to a towel and wash first his eyes, and then his face. He said that such a wash prevents eye disease and increases visual acuity. He would then worship in front of the Buddha, and return to his room for further meditation. Life at the temple began very early for all of us, with Xu Yun setting an example. At a given signal, a vegetarian breakfast would be served. However, at this time life on the mountain was very hard. Although waste land had been re-claimed, few fields had been successfully cultivated for growing millet. The best crop was that of sweet potato. We ate the sweet potato stems and leaves as side dishes, with sweet potato mixed with a small amount of rice to make a congee for breakfast. A small amount of vegetables was available for lunch, and in the evening there was no rice or noodles, but we ate what was left of the sweet potatoes. Food was not plentiful, and some monks would deliberately go without their share, so that others could eat enough. The old master would eat congee and vegetables only – just like every one else. If there were no guests, he would never eat more than the measure of food allotted to each ordinary individual. He lived a simple and frugal life-style – the memory of this is still fresh in our minds. The terrain of Yunju Mountain is very high, and is more than eleven hundred meters above sea level. In the winter the temperature falls to minus 8 – 17 degrees. Harvested sweet potatoes, that had been stored in the cellar, could not stand the cold air and their skins became blackened so that when they were cooked, they tasted bitter. Once, the monk Qi Xianshi and I shared a meal of congee together in the presence of Xu Yun. We carefully picked the bitter-tasting sweet potato skins out of the congee, and placed them to one side – intending to throw them away. Master Xu Yun saw this but did not say a word. After the meal was finished, master Xu Yun picked up the sweet potato skins we had discarded, and quietly ate them. We both witnessed this scene and felt very ashamed in our hearts. From that day onward, we never again discriminated with regard to food. Xu Yun’s physical body was very good considering his age. In the early morning, besides eating two bowls of congee, sometimes he also ate a potato. At noon, he ate two large bowls of rice. In the evening, sometimes he would eat a small bowl of noodles, or a bowl of congee. Xu Yun said that he only started to take a little food in the evening as a ‘medicine’ (together with receiving acupuncture treatment), after the Yunmen incident, before this, he did not eat after noon. His teeth were particularly good. Once, a lay-Buddhist scholar sent some fried broad beans up the mountain as a gift. The old monk saw that we were eating, and he also began to eat. We said: “This food is very hard for your teeth, will you be able to eat without damaging them?” He said nothing, but just picked up the broad beans and started to eat – he ate faster than we did – we did not expect this to happen. Xu Yun would make do with what he had. For example, his straw sleeping mat would wear-out and he would ask us to help him repair it. Eventually, it would tear in exactly the same place and it would be difficult to repair again. I suggested that perhaps he should have a new mat, as they only cost around 2 Yuan. The master listened and then loudly exclaimed: “The pure qi (vital energy) that creates a great good happiness (positive karmic fruit) is not produced by a ‘new’ straw mat!” Those of us who heard this were stunned into silence. Whether in summer or winter, the master wore a black, patch-work robe. This robe had been repaired time and time again, from many bits of different material. In the winter, the master would wear a cotton-padded jacket inside the robe. The old monk, master Xu Yun was very strict in his spiritual discipline and in his guidance of the monastic community – he made do with very little material resources. I think we monks today are very blessed, as we have an abundance of clothing, food, housing, and transportation – the like of which was not available in the past. Through a good and virtuous practice, karmic obstacles in the environment can be over-come and transformed. This is why the correct method as taught by the Buddha is to be cherished and upheld, because if the method becomes distorted no amount of practice can purify negative karmic fruits, indeed, such a practice only leads to further problems. Xu Yun once told us that he use to shave his head (and wash his feet) once a year at Chinese New Year’s Eve. This is why photographs of this time often show him with long hair and beard. However, in 1952, the old master changed his habit and started to shave his head (and wash his feet) every two months, or some times every month. His eyebrows use to grow very long – perhaps as long as six or seven inches vertical to the jaw. Some times these would interfere with eating, so Xu Yun would pull them out – but they use to re-grow very quickly. We use to gather-up his cut hair and beard and store them away, but these objects were confiscated during the Cultural Revolution. He also said that during his life he did not take a regular bath. This being so, how did he manage his perspiration on hot days? He did perspire sometimes in the days of great heat, but he was reluctant to change his clothing even when urged to do so. When he did change his clothes, unusually there was no sweat odour to be found. He wore cotton socks – which he changed once every month, or every two weeks – these too had no odour. The venerable old monk (who upheld the Buddha’s lineage) was not an ordinary person, but led a life very much like the ancient sages who existed in the distant past. Although Xu Yun was over a hundred and ten years old, nevertheless, his physical strength was immeasurable. At one time he was present at Yunmen when land was being cleared for the use of cultivating crops to feed those who were living in the monastery. During this process the workers came across a very large boulder that no one could move. Xu Yun arrived and bid every one out of the way. He then single-handedly lifted the rock out of the ground and moved it to another place without difficulty. At that time on Yunjushan (Zhen Ru monastery), life was very hard and impoverished. To survive, a tremendous amount of continuous physical labour was required. In addition to farming, there were building projects to repair the temple structures and ensure places for people to live. Despite this physical work, the daily cultivation of meditation continued in the hall without a break. Xu Yun would have a large area of ground to clear for crop cultivation each day. If the land was not cleared by sun-set, he continued in the dark, until the task was completed. Occasionally there were supplies (and other materials) to be transported up the hill during the night, with only the light of the moon to guide the way. The path was 30 li (10 miles) long. This work often went on through the night and barely finished before temple life started early in the morning. As a consequence, rest periods were very short – but the master’s vision was clear and his mind firmly accorded with the Way (Dao), he possessed an uncommon strength. In addition, two people would guard the millet fields for a time period of two hours, before being relieved by a different pair of people. This was to prevent the wild boar from attacking the paddy fields and eating the crop. At that time wild boar and tigers were common in the area. When the millet ripened, the wild boar would gather together into large groups before they came. Even though master Xu Yun was advanced in years and had a great spiritual reputation, nevertheless, he always participated in guarding the field. Master Hai Deng was in charge of co-ordinating work on the mountain at that time, and as he did not wish to see Xu Yun exerting himself in this way, he would turn-up for guard duty. Whilst living on Yunju – master Xu Yun, despite the heavy burden of his duties, often gave lectures in the hall to the general populace. In this respect he always educated the public by leading through example. 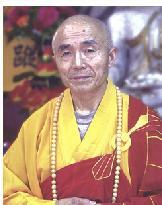 He would explain in detail how life can be lived in accordance with the dharma. He worked so hard for our welfare that it is with a sense of shame that we look back at his compassionate actions. He did every thing for us. He behaved like an ancient sage in every thing he did. During the ‘Yunmen Incident’ (1951-52) master Xu Yun suffered a number of broken bones. During 1956 to 1958 he often suffered from fevers and experienced localised pain where the injuries had occurred. He would lie on the bed moaning from the pain. However, when he had visitors he would sit up, cross his legs and greet them. He would some times talk for three or four hours and show a great spirit. In fact, so long did he often speak that we would have to ask visitors to leave, so that he could rest. When this happened, master Xu Yun would scold us, saying: “People have come to see me, so that things can be accomplished.” When the guests left, he would lie down and moan from the pain he was experiencing. We asked him how it was that when people came to see him he appeared to have no pain? He answered: “This is simply the burden of karma – even Yama is unable to control it. Karma conditions whether I can get up or not.” We were surprised to hear this. In the first month of 1957, the old master suffered from an illness. When the Yongxiu county cadres came to visit him, they saw how bad he was and sent for a car to take him up to the hospital atNanchang, so that he could to see the doctor. He was unwilling to go at first, but the cadres insisted and he reluctantly agreed. In the hospital he was medically examination, and a blood sample taken. The doctor was very surprised and said: “I have heard this monk is more than one hundred years old, but his blood sample is like that of a thirteen-year-old child. We have never seen an older person with blood like this.” After detailed tests, they said the old monk’s blood sample was completely pure. Xu Yun stayed for four days in the hospital before returning to the mountain. The purity of his blood is a mystery even today. Sometimes at noon, master Xu Yun would rest – he would fall asleep and snore. Once we hear him snore, often we would quietly leave taking fruits with us, which we would eat outside. After he awakes, he would scold us for every item we took. We asked him how it was that a moment ago he was fast asleep, and then suddenly he wakes already knowing what we had done? He answered: “Your mind still holds delusions – I am aware of this and the fact that you take things out to eat, how could I not know?” After Xu Yun said this we knew that he was completely enlightened and that he possessed an expansive awareness – whether sleeping or awake he ‘knew’ what was happening around him. One day we asked Xu Yun about his time on Mount Zhong-nan. That year he was 61 years old when he lived in the lion hut on Mount Zhong-nan. Master Jie Chen of Gaomin Temple (Jiangsu), who had heard that master Xu Yun was staying on Zhong-nan came to visit him in his hut, where he intended to debate Ch’an teachings. Xu Yun listened whilst Jie Chen spoke for a long time and then said: “You speak very well from your intellect, but you have not yet realised your mind and put an end to birth and death. Do not discuss any further, but sit and meditate with me.” Xu Yun sat for seven nights without moving, whilst master Jie Chen suffered pain in both his legs and agitation in his mind – and could only manage half a day of meditation without moving. Everyday master Jie Chen would walk around the stationary form of the meditating Xu Yun, this lasted for seven days until Xu Yun emerged from his deep contemplation. Jie Chen asked: “When you are in meditation, is there self-awareness, or no self-awareness? If there is no awareness, isn’t this just like the state of stagnant water, within which no dragon can hide” Xu Yun said: “If you want to know about Ch’an with the intellect, the dharma will not be understood for it is only through the realisation of enlightenment that Ch’an can really be understood. The Mind Ground is naturally clean. Due to not knowing this fact the path toward enlightenment is never followed, as a pure ‘doubt’ can not be generated. When the mind is realised a pin can be heard dropping to a ground. While I was meditating I was fully aware that you were walking around me. I know because compassion does not distinguish between one being and another. This is not dry knowing as the mind is equal everywhere and never ceases its compassionate function. The last seven days have passed like a finger snap to me because my mind is concentrated fully upon its essence. The Ch’an Dao – or ‘Mind Way’ is clear and bright and never without compassion. A pure doubt, when harnessed correctly pushes through the surface layers of delusion so that the Mind Ground can be clearly realised – this is the powerful method of Ch’an.” Since this time master Jie Chen followed master Xu Yun and held him in the highest regard. Later, Master Xu Yun spent 18 days in meditation. Many people got to know of his presence and continuously came to show their respect to him. The master became tired of the constant interruption and so he and master Jie Chen decided to leave Zhong-nan (carrying their baggage upon their backs) forEmeiMountain. One evening the two of them spent the night in a deserted, isolated temple. Master Xu Yun went to sleep, but master Jie Chen was bitten by fleas, which he picked off his leg and threw to the ground. Master Xu Yun heard the cries of the fleas and the next morning told Jie Chen about it. Master Jie Chen thought how surprising this was, and considered this remarkable ability to be the product of the master’s physical and spiritual purity. Afterwards they left forYunnan province, where master Xu Yun wanted to revive Buddhism in the area by building a temple, but both he and Jie Chen were prevented from doing so by the hereditary system that was common at the time. The area was controlled by monks who passed on Sangha property within families so that no one from outside of the area could stay for long, or teach. In reality, although master Xu Yun did not meditate for 7 or 8 days at a time, and was very busy throughout the day, it is true that often he would meditate through the night with no sleep whatsoever. In this way he kept his meditation practice in good order behind the scenes. It is said that when an arahant appears to walk across the ground, his feet do not actually touch it. Some people have asked that as I often walked with the old master – also known as the great Buddha – did his feet touch the floor when he walked? Did his shoes touch the soil and the mud? We must carefully consider this matter. Yunjushan is comprised of muddy soil, as it often rains. When most people walk around the area their shoes become covered in mud, but Xu Yun’s shoes always appear to be clean. When we walked behind him, we could see his shoes touching the ground, but when we got back and looked at his shoes, there was no mud on them. This is a mystery that we have not mentioned before. In 1957 a fire started on the mountain at the Eternal Truth Temple (TianRuSi -真如寺). Many people rushed to the area to put out the fire. Master Xu Yun asked us to follow him so that we could also help. He put on a short gown and walked very briskly in front of us. As we were about to ascend the mountain – Xu Yun disappeared – and then suddenly re-appeared standing on top of a large rock, some distance away from us. We asked him how it was that one moment he was stood near us, whilst the next he was far away? He replied that we should all hurry to the site of the fire. We did not understand how he moved so fast or covered such a distance. At that time master Xu Yun use to lecture in the meditation hall every evening, or every other evening. When the time came for him to teach the Dharma, incense would be lit, the smoke and fragrance of which would spread far and wide. At these times the crows that lived on Yunju would gather around the hall to hear Xu Yun teach. So dense were they on the path between Xu Yun’s hut and the meditation hall that we would have to move them out of the way with a stick – to avoid them being trodden on. When Xu Yun finished his lecture and returned to his hut, the crows would return to their nests. In this way we know that the crows were intelligent. In early June, 1957, the weather was extremely hot. One day, master Xu Yun suddenly requested to go to the Five Old Peaks (Wulaofeng) to survey the terrain. The sky was clear, and five other people and I made a small sedan-seat out of a rattan-chair and two bamboo poles so that the old master could be carried on the journey, with three teams of two people taking it in-turns to carry the chair and occupant. By the time we left it was nine o’clock and the sun was very fierce. We were collectively concerned for the old master’s health as we thought he might be physically weakened by such exposure to the heat on an arduous journey such as this. What is strange is that when we began to carry the sedan-chair in the heat, crows began to flock over-head and formed a shadow over Xu Yun and his chair. Wherever we moved the crows formed a protective cloud in the sky and we did not have to worry about the heat. The crows followed us all the way to the Five Old Peaks, and after Xu Yun got out of his chair, the crows landed all around and looked at him, crying out as they did so. Xu Yun remained on theFiveOldPeaksfor a certain time examining the surrounding area, before returning in the chair. As soon as we lifted the chair the crows flew into the sky and resumed their duty of shielding Xu Yun from the hot sun. They did not disperse until Xu Yun had safely returned to his hut, and then they broke formation and flew away. When entering the hut, master Xu Yun said: “Today you were afraid that the sun would be too hot?” The six of us who had accompanied the master on the trip had to stop ourselves from laughing. We said: “Your venerable presence inspired the crows to form a dharma-shield to protect you from the sun which is why the heat was not as bad as we thought it would be.” The crows followed the Dao and protected Xu Yun – for this we were very grateful. In a short-time, the storm developed, blowing strong winds and heavy rain to the west of the hut. The rain fell around five feet from that wall and continued for around an hour. Although the rain dripped from the roof around the hut, there was no drop of rain on the newly repaired wall. After the storm subsided, the four workmen were happy and ran to the master and made a bow of gratitude and thanks. Master Xu Yun, however, remained silent throughout. The ancients said: “The lofty Way (Dao) of the dragon and the tiger is worthy of respect. The power of cultivated virtue (in the mind) is respected even by the spirits of nature.” This saying is true because the virtuous power of the enlightened nature of master Xu Yun prevented the dragon king (of the sea) from letting rain fall on the repaired wall. In mid-May, 1957, the paddy fields had just been planted with seedlings when the mountain area suffered from several days of very heavy, continuous rain fall. The mountain became flooded and the An-yao (Peaceful Joy) Bridge was swept away. The mountain streams burst their banks and the mud and stones threatened to rush into the paddy fields. At around mid-day master Xu Yun was seen by master Hongqing walking in the wind and rain wearing only his robe and straw sandals toward the paddy field. He ran after Xu Yun taking an umbrella with him. What is strange is that when master Hongqing found Xu Yun he saw that instead of the flood water flowing down into the paddy fields; it was actually flowing away from the area, toward the east-side of the mountain. More than this, however, the flood water appeared to be flowing upward from low level to high, rather than following the normal behaviour of water, which usually flows from high ground to low ground. This is how the new seedlings escaped from being buried by mud or swept away by the flood water. We saw that the old master’s robe had very few rain-drops upon it – and only his straw sandals were wet. When an enlightened master (who has realised theGreat Way[Dao]) walks through a storm, even the water has to give way. His entire (long) life, his actions, every word, and every phrase serve as our guide and will be an inspiration for future generations. In his long life he restored over 80 temples and monasteries (such as Nan Hua, Gu Shan, and Yunju) all over China in places such as Yunnan, Guangdong, Fujian and Jiangxi provinces, etc. Xu Yun inherited all five Ch’an schools and breathed new life into the old lineages, bringing them into the modern day. In so doing, he single-handedly revived and preserved the Ch’an doctrine in its many variants within China. In the Linji lineage he was the 43rd generation Dharma inheritor; in the Cao-Dong lineage he was the 47th generation Dharma inheritor; in the Wei Yang lineage he was the 8th generation Dharma inheritor; in the Fayen lineage he was the 8th generation Dharma inheritor; and for the Yunmen lineage he was the 12th generation Dharma inheritor. He personally ordained thousands of people and has probably over millions of students in bothChina and abroad. In 1958 China was in the grip of so-called Socialist re-education. Ultra-leftists used this time to cause all kinds of trouble in the country. Master Xu Yun, due to his good spiritual reputation became a target for these activists. As Xu Yun was a member of the National Committee he could not be directly or openly denounced, so the activists set about trying to undermine his good standing in the public perception. This they did in a number of slanderous ways accusing Xu Yun of all kinds of bad and hypocritical behaviour. Their allegations, however, were inconsistent with the well known facts. Throughout this experience Xu Yun remained calm and polite, but in his heart was a sadness that could not be expressed in words. In 1958, he said to us: “Soon I will have to leave.” We were sad and asked: “Why does the venerable master want to go now? He answered: “You do not understand. There will be ten years of crime in China that will cause untold suffering.” We did not understand him at that time – afterwards came the Cultural Revolution. Starting from 1958, master Xu Yun started to suffer minor illnesses on a regular basis. At this time he started to make arrangements for after his passing – ensuring that the Ch’an teachings would be carried-on into future generations so that the entire world might benefit from them. On October 10, 1959, the old monk wrote his will, it said: “My last words of instruction are to advise you to work towards the over-coming of greed, hatred and delusion, to achieve this one should practice discipline and meditation to generate wisdom.” Later he added: “With righteous thoughts a pure mind is created. Cultivate a spirit of Dharmic fearlessness so as to inspire the people of the world.” He then advised us to follow the precepts to ensure an effective and positive practice. At around 12 noon on October 12th, 1959, Xu Yun told one of his attendants that he had just had a dream within which he saw a cow trample on and break the Buddha-seal Bridge and witnessed the stream stop flowing. He then closed his eyes and was quiet. At 1230pm he called his attendants to him and said: “You have been with me for many years and suffered many hardships on my behalf – for this I am deeply moved by your example. Although there is no point raking-up the past, it is true that for the last ten years I have suffered extreme hardship and slander to protect the true Dharma. I have risked my life to protect the Dharma. As my close disciples you know the truth of this matter. Whether you live in thatched huts or travel to other monasteries, you should keep this Sangha robe as an expression of our faith. How should the Dharma be preserved? In a single word – ‘sila’ – it is through discipline.” He then brought his palms together and asked his attendants to take good care of themselves. The attendants, holding back their tears, went outside to wait. At 145pm on the 13th of October,1959, two attendants entered his room and saw that master Xu Yun passed away, serenely lying upon his right side within his hut on Yunju. For a month afterwards the monks and masters, when walking to and from the meditation hall, could see a bright light emanating from the hut. Eventually the bright light faded and we proceeded to care for Xu Yun’s body according to his written instructions. Xu Yun dropped his body on the 13th of October, 1959. His body was encoffined on the 18th of October and cremated on the 19th of October. The next day there was a fire on the mountain (at Zhaochouguan) and as there was around a hundred people living there, every body went to help to put it out, leaving only the sick and the elderly in the temple. Masters Kuan Huai and Kuan Ke went to look into the cremation furnace holding Xu Yun’s remains and were surprised to find his body still holding its shape despite having been thoroughly exposed to the flames. They thought that this was most unusual. They touched the body with a piece of tile – and only at that moment did the body crumble into ashes, falling flat. Master Kuan Huai reached into the furnace and amongst the ashes found a number of bright crystal-like relics. Not long after this, the people who had left to fight the fire, returned. The knowledge soon spread that there were many relics contained within. Many people grabbed a handful of ashes and fled to hide in the hills, as at that time it was not allowed to value such things as spiritual relics. There were relics of all different colours, shapes and sizes – the true number of which can not be fully known. Due to the taking of the ashes and relics, the abbot – Xing Fu – ordered masters Hui Tong and Zi Xiu to guard the remains and sieve out the remaining relics. Many relics were recovered, some glittered and were translucent like quartz, one of which was crystal clear and about the size of a thumb – this was sent to master Hai Deng who delivered it to Mount Tiantai, Zhejiang province. Master Da Ding was working in the vegetable garden during the cremation and when he arrived (late) at the furnace, he found only a piece of bone left, which he took with him back to the garden. He broke the bone into pieces and found a blood-red diamond-like relic, a similar size to a red-bean, and another smaller relic stuck to a piece of the bone. A master finally returned to the temple who had been fighting the fire. When he heard that there were relics among the ashes he made haste to the cremation furnace. However, when he arrived he found only an open space with even the ashes swept clean. Seeing this, the master burst into tears and started digging the ground with a shard of bamboo. After digging around two inches down, he suddenly discovered a crystal clear, bright white relic about the size of a soybean! The master was over-joyed to have found this valuable Dharma-relic, which with all the others formed a treasury which served to demonstrate the spiritual purity of master Xu Yun. At that time, many people saw Xu Yun sat cross-legged within the relics themselves. Many could even see his long eyebrows very clearly. These relics have now been placed inside the stupa. Then there were those who wished to slander the followers of the old monk and said that the relics of Xu Yun were made out of amber, and that these bits of amber had been placed into the cremation furnace with his body. However, this slander was disproven when a test was performed which saw amber placed into a hot fire; it eventually turned to ashes. When Xu Yun passed away the situation inChinawas very tense. Due to governmentally inspired re-education and re-organisation programmes, the Buddhist reality of Xu Yun’s passing could not be made openly known through fear of reprisals. As these times were so difficult it is not possible to know exactly how many relics there actually were – certainly there were more than one hundred, but the real figure is probably far beyond this number. The smaller relics were plenty and just their number can not be adequately guessed at. Some people believe that the number of relics was over a thousand. The remarkable exploits of master Xu Yun are many and varied, and are recorded in his full autobiography – the Xu Yun He Shang Nian Pu. All these experience are true and not the product of empty words. Many people who knew Xu Yun during his life have witnessed the happenings with their own eyes and ears, and have recorded them for the benefit of future generations. I only knew Xu Yun personally during the last three years of his life – so my recollections deal more or less exclusively with that time. The facts that I have related here are presented with compassion for all living beings. I shall, therefore, leave it here and bring this discussion to an end. A deep bow of respect – to the old master Xu Yun. Next Post: Master Ming Yi – Shaolin Temple Ch’an Weeks Retreat.